The New York Times is launching new video ads to convince people they should pay for its content. Here’s a thought. If the New York Times, or the Wall Street Journal for that matter, want to be paid what they’re worth, how about giving subscribers a set price they can depend on? 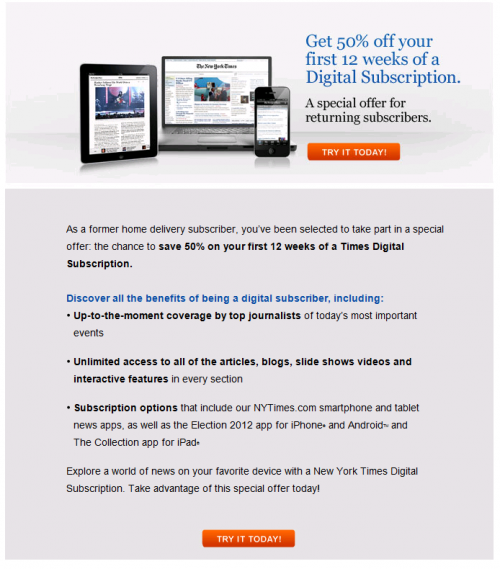 A price that doesn’t overcharge the digital subscriber? Below, a case study on the deliberate pricing confusion both publications pursue. Way back in 2009, I received some junk mail from the Wall Street Journal offering me the paper for $100 per year. For me, it was a no brainer. I love reading a print newspaper. Getting a high-quality paper six days per week for cheaper than I could get my own local paper, the Los Angeles Times? Bring it on, especially since I’d also get easy access past the long-existing WSJ paywall. After a year, my subscription expired. I got a few notices, but I balked at paying the $250 (if I recall right) that the WSJ wanted me to pay to renew. If it was worth $100 for an entire year, what made it suddenly worth 2.5 times that amount the next? Of course, the answer — in part — was that I’d been given an introductory rate. The goal was to get me hooked. Unfortunately for the WSJ, I didn’t need the paper that bad to stay hooked for the higher price. I chose not to renew. That didn’t stop the papers from coming. Nope, for three months, they continue to be delivered. It was even inconvenient that I couldn’t put them on a vacation hold, since I no longer had an official account. About a week after they stopped coming, I got a phone call. 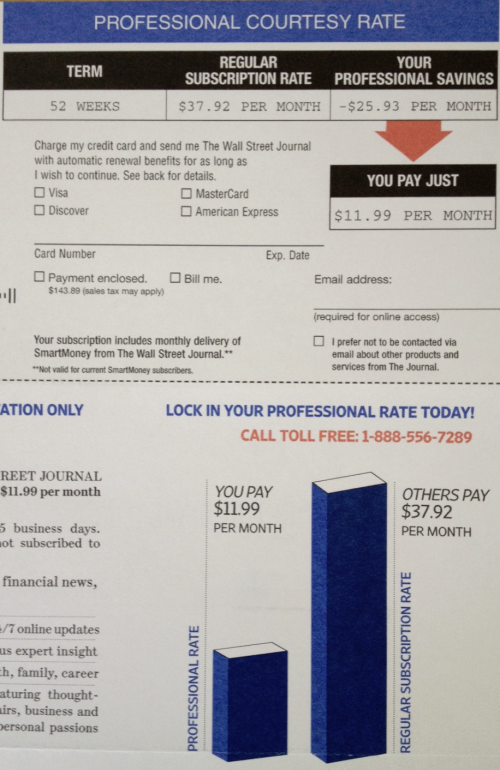 It was the WSJ, wanting me to renew and offering me that same $100 rate. I was happy to take that again. In late 2011, the notices came again that my subscription was expiring. By this point, I’d learned that if I just let the paper expire, I’d probably continue to get it for free. If I didn’t, inevitably I’d get a call urging me to renew at a lower rate. So, I let the subscription expire. The call didn’t come soon enough for me, however. In January, there was an article that I really wanted to read. It also wasn’t one that I could unlock using the usual trick of going through Google News. I ended up renewing at the $260 (or so) per year regular rate. Actually, the regular rate is even higher than that, as I’ll get into further below. Why Do You Want To Keep Overcharging Me? Success for the WSJ, as I even noted in a later article explaining why that Google News trick had been deliberately blocked as part of a changing policy with the Wall Street Journal (see WSJ Pulls Back On What Google Searchers Can Read For Free). Restricting the content got me to renew, even at a higher price. Success was short-lived, however. About two weeks ago, my phone rang. It was the WSJ (well, a telemarketer working for them) offering me a $100 per year deal. Did I want this? The rep was very eager for me to take it. So was I. Naturally, I signed up. At the very end, I asked what about that subscription I’d just renewed. Much confusion then followed. I was told that I couldn’t have the offer, if I had a subscription already. I was puzzled. Surely the Wall Street Journal should know that I already had a subscription, right? The telemarketer really didn’t care. She’s stumbled into an area that was clearly off the playbook, with a subscription that probably wouldn’t count to her quota, so simply wanted me off the phone. She told me I couldn’t have the deal, and that I’d need to call the Wall Street Journal directly to follow-up. Funny how quickly she went from being the Wall Street Journal to having nothing to do with them. See under “Status?” My account was shown as “Active” but with an expiration date of 2/23/2012, which at the time the telemarketer had called me had passed two months prior. I said that as far as I could tell, my subscription had expired two months ago. That was enough for her, in the end, to declare she could let my subscription go through. A few days ago, I received a paper “renewal acknowledgement” of it. Actually, I received two. Going online today, one renewal was for the account I renewed in January. Another was for a “renewal” of the new account the telemarketer had created for me. For the past two weeks, the WSJ has maintained two different subscriptions for me, under the same exact name, at the same exact address. I’ve been double-dipped! And I’ve only gotten a single paper delivered each day! Hey, I’m not complaining. I got a bargain on that second renewal. The WSJ can keep the extra $10 or so it made during my double-dip period. I called today, and my January subscription was cancelled. My “new” one is good through April of next year. I’m happy. Really, You Want Me To Unsubscribe To Save? Of course, I’d have been happier if I hadn’t gone through this in the first place. Why not offer me a reasonable price in the first place? Why train me to think it makes more sense for me to just cancel? I’ll get back to some answers on this, but let’s talk about the New York Times now. Last March, I took the New York Times to task over its paywall. The pricing made little sense. It limited visits from search engines but not from social media for archaic reasons that seemed stupid. But I also signed-up for a subscription. I appreciate good journalism. The New York Times has some of that. I thought I’d show support with my pocketbook. I enjoyed getting the paper each day, and the initial rate made it a good deal. I think I paid about $4 per week or around $200 per year. Later that year, I realized my rate had doubled. Ah, yes. The introductory rate was only for the first 6 months. After that, there was an increase to around $400 per year. That was too much. I already had the Wall Street Journal coming, along with the Los Angeles Times. I didn’t need the New York Times delivered as well. In fact, the main reason I was getting the print edition was because it was cheaper to do that for digital access than pay for ONLY digital access. I called, to see if I could get a better rate, but I was told that was only possible if I let my subscription lapse. Yes, the New York Times would rather have me not read its paper for six months than to continue reading it and seeing all those overpriced print ads. Of course, when the special 12 week/three month rate expires, I’m right back to that regular rate that made me quit in the first place. Which may or may not be cheaper than if I didn’t take the offer. Oh dear, oh dear, what to do? What am I in the mood for? If I want to pay the least — and have no idea that I can simply tweet any article to myself to bypass the paywall — I guess I can shell out $195 per year for web and smartphone access. If I’m really into reading through a tablet app, I can go up to $260. But darnation, what if I want to read on both my phone and tablet? The technology required to make that happen costs about $140 more. I need to pay $400. At that rate, I might as well pay to have the damn paper delivered each weekday. If I do that, then I actually save $55 and get unlimited digital tossed in for free. That calls into question the value of the digital subscription. How on earth does the New York Times find it costs less to throw a physical paper on my doorstep each day than to sell me a pure digital subscription? Again, I’ll get back to that. Meanwhile, the introductory offers are all confusing. Online, there’s a four week discount. The email offer I received gives me a 12 week discount. If you go print, you get a 12 week discount. Anyone thinking they wanted to do digital only, but who is really worried about the money, might be better off taking the 12 week print weekday+digital offer, then switching after that. You’ll save a lot over the additional two months. Is your head hurting? Mine sure is, and I haven’t even mentioned that an email I got last year from the New York Times still works to give me a 26 week intro period on digital products. That’s not an intro rate, either. It lasts as long as I act within five days. I’ll tuck these offers away. Somehow, I suspect in a year, I’ll find they’ll still work if I need to use them. Of course, I probably won’t. In a year, my intro rate that the telemarketer gave me will expire. I’ll probably let the paper lapse again, then I’ll get a call, and, well, I think we know the score. Let’s recap. Net neanderthals encouraged by Google to believe everything is free were so harming major papers like the Wall Street Journal with their worthless visits that we even had to have an FTC workshop/hearing to let Rupert and Arianna square-off about what’s fair. Meanwhile, the New York Times finally unveiled its paywall last year just in time for publishers to start deciding that getting some of those ad views wasn’t so bad, so let’s leave a billion holes in the paywall, because heaven-forbid we don’t get traffic from places like Facebook or Twitter, when people complain about the paywall blocking them. Let’s do all this and assume no one will figure out that we’re charging less for digital access, in some cases, even when we assume the physical costs of actually delivering a paper. 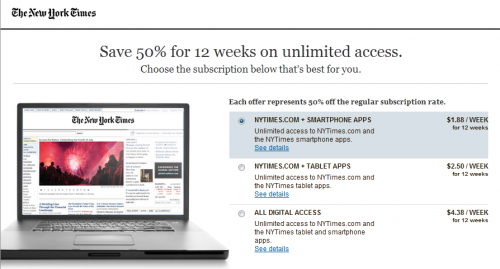 Our readers are intelligent enough to be told they must pay to support quality journalism but apparently not intelligent enough to figure out that it shouldn’t cost $55 less to have the New York Times delivered each weekday and get digital access versus digital-only access. Or that it shouldn’t cost only $88 per year more for the Wall Street Journal to have someone throw a paper on my doorstep six days a week versus just giving me a digital product. The digital products are overpriced compared to the print products. That’s because, in all likelihood, a print subscriber is still stupidly deemed worth more to advertisers, even though I’d wager most of us ignore most of those print ads. Under audit rules, newspapers can count paid digital subscribers more than once if they have daily access to digital content on multiple platforms like mobile apps or tablets as part of a bundled subscription package. Maybe I’m reading it wrong, but then again, it doesn’t matter. The circulation figures are an artifact from the past. They are a figure used by sales reps to convince advertisers how many people view their ads, as if those 800,000 print subscribers to the New York Times look at each and every print ad. Now another 800,000 digital subscribers can be added to the mix (many of whom might also be print subscribers), so the numbers get bigger but still mean little. 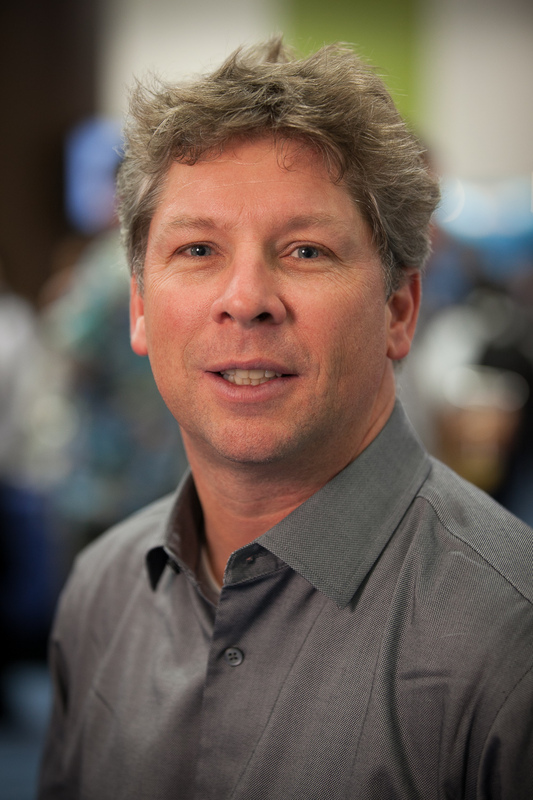 If you’re talking digital, you’re talking pageviews. And if you’re talking digital ads, then you know the exact impressions of those ads plus some sense of engagement by clickthrough or other metrics. So why count “digital circulation,” and what’s it really mean? In the end, it makes lots of sense for newspapers to have a balanced model of ad revenue along with subscription income. Paywalls aren’t bad. I’ve run them myself. But what is bad is overcharging your digital subscribers in a way you’d never do to print ones, simply because you’ve overvalued the print ones for too long.